“When the river flows warm in spring, the pigs know first,” says an ancient Chinese poem… although in the original, it was ducks who first knew about the change in season. Chinese Internet users have begun making light of the fact that, like this time last year, pigs have again been found floating down a river in China. According to reports, 137 dead pigs were on March 18 fished out from the Ganjiang River, a major artery in Nanchang City in Jiangxi Province, by the local environment protection department. A local had spotted the floating carcasses on March 15, while taking a swim in the river. Pig bodies washed onto the banks, and locals told the authorities, according to the local newspaper Jiangxi Daily. No one is sure who dumped the pigs upstream. A director at the Nanchang City animal disease prevention and control center told the Jiangxi Daily that the pigs mostly died from infectious gastroenteritis, a common disease for hogs during the season. The Ganjiang River supplies water for Nanchang, and the intake spout is close to where the dead pigs were found. Staff for the water supply company told Chinese media that the water was entirely normal, and that no pollution has been detected. “Once a dead pig shows up in the water intake area, we will report it immediately and take emergency measures to prevent water pollution,” the staff said. Worried residents were not reassured, with many comments online questioning the quality of the drinking water, and urging a solution. This year is the second in a row in which large numbers of dead pigs have been found in rivers. Last March more than 10,000 decaying pigs were found in Huangpu River that runs through Shanghai. It took over two weeks for authorities to fish them out of the river. 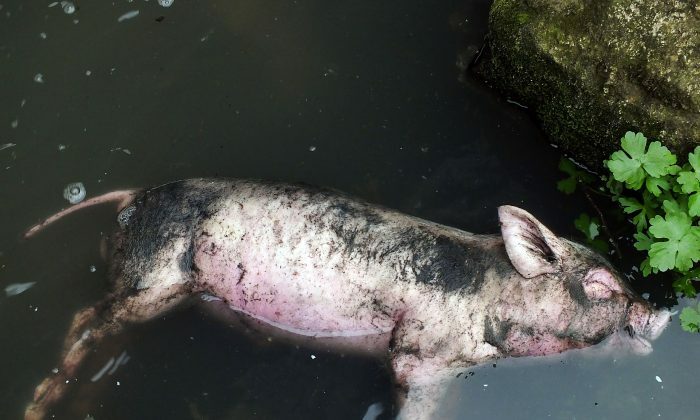 Dead pigs have also been found floating in rivers elsewhere in China, including in central Hubei Province, Henan Province, and northern Liaoning Province. They are assumed to be dumped by pig farmers who are eager to offload their diseased livestock. Chinese reports say that while burning or burying the carcasses can be costly or time intensive, simply throwing them into a river costs nothing.